If you are interested in having an aquarium, taking care of fish and shrimps, as well as exploring nature and sea life, or if you already own an aquarium, you must have heard of the Amano shrimp. Today, this tiny shrimp is one of the most interesting inhabitants of aquariums around the world. This is the second top-rated type of water organisms when it comes to popularity, immediately after the Red Cherry Shrimp. Amano Shrimp belongs to the Decapod order, family of Atyidae, class of Crustaceans. Its scientific name is Caridinamultidentata. It has other scientific name, based on its place of origin – Caridina japonica. However, did you know that this specie has more than 6 common, colloquial names? Its most famous name, Amano Shrimp, was inspired by the well-known aquarist Takashi Amano, who often uses them to decorate his aquariums. He takes care of these shrimps as purposeful residents who maintain the invaluable algae in the aquariums. Only some of the other colloquial names of this shrimp include Yamato Numa-ebi, Yamato shrimp, Algae shrimp, and Japanese marsh shrimp. As you probably already know, Amano shrimp originates from Japan. In addition, it is naturally found in Korea and Taiwan. River with a pH value between 5.8 and 8.0, with temperature range from 12ºC to 28ºC, is the key ecosystem of this shrimp. Its natural habitat includes marshes and swamps. Salinity type is limited to freshwater when it comes to grown-up Amano shrimps, but the maggots must be transferred to salt water. You probably wonder if you will be able to spot an Amano shrimp if you look at an aquarium full of different kinds of water organisms. Don’t worry! Even a glance at this type of shrimp reveals some very interesting, peculiar physical features. It is the color of its body that helps us immediately recognize this type of shrimp. Namely, it is transparently covered with brown spots located along its slim body. Those spots, when observed as a whole, look like a broken line. Their color varies from clear, glassy with a 0,3 mm, reddish and brownish dots and a line on their back in the same color. How can you differentiate the sexes? The female Amano shrimps are bigger and fuller. They have larger stomachs and abdominal pockets. If you’re lucky, you can see them in aquariums as they carry the eggs in those pockets. Potential size this type of shrimp can reach is up to 5.5 cm for females and up to 3.8 cm for males. Their lifetime is limited to about three to four years. Amano shrimp is an omnivore. This means that they eat both plants and different kinds of fish. Amano Shrimp is, like most of the other kinds of shrimps, an aquarium cleaner, i.e. its diet is mostly based on collecting residues of food and waste in the aquarium. Most people who have this type of shrimps claim that they are actually the very best algae eaters and aquarium cleaners. They are famous for eating almost all kinds of algae, which is one of the reasons for their popularity. However, they do avoid the so-called “spot” algae and “black beard” algae. They sometimes do eat them though, but they need more time to consume these types of algae in comparison to the other types. Common segments of their nutrition provided by humans in artificial conditions include algae, all common types of fish food, frozen foods, flakes, special shrimp pills, plants, fish, etc. Except for the specialized Amano Shrimp food, you can feed it with well-boiled spinach pieces, fishing worms, spirulina tablets, etc. When it comes to additional nutrition, you should narrow it down to only once a day. Always dose the amount of food according to the needs of the shrimp within the time frame of 2-3 hours. Excessive feeding is not good because it directly affects the amount of waste that is deposited in the water. As a result, you will have lower water quality. Another reason why you should avoid over-feeding the Amano shrimp is the fact that this type of shrimp is likely to die if overfed. Here’s a special note for you: The Amano shrimp seems to never stop eating, so you will be able to see these valuable little cleaners all over the aquarium, as long as they feel safe and comfortable in their environment. If they stop eating – cleaning the aquarium, this is a sign that there is something wrong with your little shrimps. Amano shrimp is complicated when it comes to breeding. The females produce the eggs regularly and they carry them for about 4-6 weeks. You can recognize them as small white dots floating and swimming on the water surface. What most people do not know is that most Amano shrimps are actually caught in nature and as such distributed to aquariums and aquarists around the world. This does not mean, of course, that it is impossible to successfully breed this kind of shrimps in aquariums, but it is difficult and rare. To grow the maggots, you will need clean water rich in oxygen with a salinity of about 30 g/l or 4 oz/gal. You can use sea salt usually used for reef aquariums. It is useful to have an extra tank that has access to the non-direct sunlight (the maggots can eat algae), with established nitrogen cycle (for several weeks) and with a water temperature of 24 degrees Celsius. The oxygen will be created through the process of algae photosynthesis. You can experiment with an air pump, but you have to make sure that there is not too much movement that will push the maggots towards the aquarium glass. A gravid female Amano shrimp carries many eggs. This is predetermined by nature in order to compensate for the loss of a large number of maggots during their development. Amano Shrimp comes to the world as an egg that emerges in the form of small larvae or the nauplius. They are very gentle and require special attention. You should separate the gravid Amano shrimp female into another aquarium to ensure safe conditions for the development of the maggots. Larvae is best fed with phytoplankton. It is useful to feed them every day with a few drops of liquid food for young shrimps/maggots. 4 weeks later, they will continue to “hang” underneath the surface of the water with their heads down, but it will be easier to recognize them. After 6 weeks, they will be at the bottom of the aquarium and then, you will see how the “real” Amano shrimps are formed. Their size will be about 0.5 to 0.8 cm. This is when you can start giving them small parts of algae pellets. During these few weeks of their development, it is necessary to change the water content for about 20% (of the total water content in the aquarium), a few times. Try using a strainer to prevent the maggots from being sucked into the gravel cleaner. 12 weeks later, you will have to partially change the water every 5 days and after 16 weeks, you can put the small Caridina japonica into the regular freshwater aquarium. Their acclimatization process to the aquarium water is the same as that of the newly bought fish. There are several common questions you must answer before you decide to take care of Amano shrimps. One of the questions is “which type of fish can I keep in the same aquarium, without endangering my Amano shrimps?” We will discuss this particular issue later. The point is, this and some other questions are very important and you must ask and answer these questions before going into the story called “Gentle Amano shrimps”. Otherwise, you will be disappointed at the very beginning. For example, putting your shrimps in the same aquarium with certain types of fish can lead to a treat for the fish and the Judgment Day for the shrimps. When you decide to get some Amano shrimps, you must know that they can be rather expensive. Regardless of the fact that we provide them with adequate conditions regarding water parameters and the environment itself, don’t forget that they are also a natural source of food in nature for most kinds of fish. Natural conditions and variations in the quantity (number) of Amano shrimps in a given moment dictate the price. Now, let’s talk about the basics of Amano shrimp care. First of all, there is something we often forget or neglect when it comes to preparing the aquarium for the shrimp. In this particular case, we are talking about the natural ability of these beautiful shrimps to hide. In a natural environment, Amano shrimps spend most of their time hiding from aggressive kinds of fish. The color of their body mostly helps them in hiding from the predators, by imitating the color of the aquatic habitat, whether it is the bottom of a lake or a stream or color of a plant that prevails in that area. Therefore, you should not forget this story. When you are designing your aquarium, make sure you arrange it with special attention to algae and other plants suitable for Amano shrimps and their hiding activities. Dark colors are the best choice. There should also be some improvised caves. Amano shrimps enjoy these kinds of places. In specialized Amano shrimp breeding centers, a lot of attention is paid to this ability of the shrimps to hide from their natural predators, as this is what makes them feel safe in an aquarium. Unfortunately, years of crossbreeding and cultivation of the Amano shrimp with other species led to a diminishing of this amazing natural feature. Today, most Amano shrimps have colors ranging from bright red, blue or completely white and such shrimps cannot be found in their natural habitats. These colors and variations are the product of selective breeding. By removing this natural defense system, we have unfortunately reduced the chance of survival of Amano shrimps in a common aquarium with potential predators. Sadly, some of these interesting and attractive types of Amano shrimps we know today literally seem to be carrying a neon sign saying “eat me”! However, we don’t intend to make you give up on taking care of the lovely Amano shrimps. Our goal is to help you understand that you really shouldn’t place them in the same aquarium with aggressive or large types of fish. We want to help you become more dedicated to successful and high-quality Amano shrimp care. Consequently, there are very few species of fish that can be successfully kept in the same aquarium with Amano shrimps. These are the types of fish that consume exclusively algae, as all other species of fish are potential predators and represent a threat to Amano shrimps. This does not mean that it is impossible to keep a fish and shrimp together, but it obliges us to create such an environment that will be safe and pleasant both for the fish and for the Amano shrimp. We will talk about the allowed aquarium mates in one of the following paragraphs. Now, let’s talk more about the aquarium size and water capacity requirements. As with fish, you need an aquarium that should have a 10L capacity or more. Less than that is too small for a pleasant life of Amano shrimp. Also, you need a small filter that does not have to be too strong and a lamp that can also be a bit weaker because moss and algae are the best plant species. You don’t have to have a heater, as Amano shrimps prefer slightly cooler water, i.e. not over 26°C. Therefore, if the aquarium is in a heated room, the temperature is mostly around 22°C, which is an ideal temperature and you don’t need a heater. Furthermore, you must be sure that there are no traces of heavy metals, namely copper in your aquarium, nor the system hoses. Copper is highly poisonous for Amano shrimps. Note: Make sure that you do not use any shrimp/fish medicine that contains copper. As we have already said, it is poisonous for Amano shrimps. In addition, remember that if the temperature of the water reaches 28 degrees Centigrade, the protein clotting process in Amano shrimps will take place and they will, unfortunately, die. Most noteworthy, they are very sensitive during the shell changing process, as the new shell is not hard yet. Another key safety note says that you must make sure to safeguard the aquarium vents and openings, as your Amano shrimps might get sucked in by the filtration system. It would be better to use pre-filters to prevent them from reaching the main filter. First of all, let’s talk about the basics and most common causes of death of Amano shrimps. We must first point out that Amano shrimps are resilient if kept in the required conditions. They are not very prone to becoming sick. However, they do require special treatment. This is why a high mortality rate is not unusual for Amano shrimps shortly after being introduced into the aquarium. Almost all Amano shrimps are caught in the wild, i.e. their natural habitat, which is, as such, sometimes very different from the aquarium environment. It is difficult for them to adapt to new conditions. Also, the lack of food can cause a fatal outcome. This is the basic mistake made by aquarists when purchasing these shrimps. They think that it is enough for them to clean the aquarium. Don’t make this mistake and remember that they are not fed exclusively by algae and you do need to provide an additional source of food for your shrimps. Furthermore, diseases and death outcome are often caused by stress during the transportation, unprofessional handling of the shrimp, and inadequate acclimatization. Carradine japonica is also very sensitive to ammonia, aquariums in which nitrogen cycle is not established, as well as heavy metals, especially copper. You must also pay attention to the CO2 levels. If there is too much CO2, the pH of the water decreases. Keep in mind that your Amano shrimps will become sick if the water pH falls below 6.0. You should keep the water pH level between 6 and 7.5. Anything over 7.5 also negatively affects the shrimps. Their lifetime will be significantly shorter in such an environment. Now, let’s talk specifically about certain diseases common for Amano shrimps. As we have already said, they are not prone to diseases, except two or three conditions. Those include the attacks of the Planarian flatworms, fungi, and poisoning. The first two are rarely seen if you stick to the required aquarium care and maintenance rules. Poisoning, on the other hand, is the greatest threat to your Amano shrimps. This refers to a wide range of substances, including copper, insecticides, different pollutants that enter the aquarium via plants (if not well-rinsed), etc. Symptoms include a sudden change of color, immobilization, and twitching. If your Amano shrimp becomes white or pink instead of transparent, if it lays still at the bottom of the aquarium, or if you notice any twitching, you must know that it had been poisoned and the final outcome is death. Unfortunately, there is nothing you can do to save it at that point. This type of shrimps is not aggressive at all. They are very peaceful and calm. Since they have enough hiding opportunities, both in their natural habitat and in well-designed and organized aquariums, Amano shrimps are definitely not shy. During the day, they are rather active. 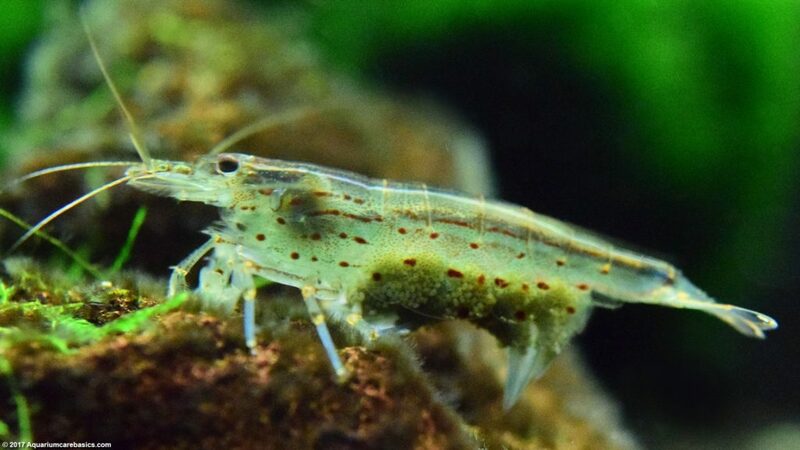 Amano shrimp mostly resides at the bottom of the aquarium or on the leaves of the plants while cleaning the aquarium as its key daily activity. In addition, you can sometimes see it swimming freely through the aquarium. Their best aquarium mates are non-aggressive small fish kinds. For example, small tetras that cannot harm them are good aquarium mates. Other than that, you should keep the Amano shrimps away from other aquarium inhabitants. Keeping them separately will ensure that they will not be eaten by larger fish. Kinds you must avoid include barbs and cichlids.